Looking for easy and colorful Valentine’s Day treats for kids?! These Chocolate Dipped Sugar Wafers are ready in now time and kids will have a ton of fun decorating these wafer cookies with colorful candy melts, sprinkles and more! Chocolate Dipped Wafer Cookies is a super easy Valentine’s Day Treat the kids will love decorating!! Everyone I talk to seems to be in a bit of a slump lately. I think it’s normal this time of year as we’re half way through winter and fighting off the Winter Blues, but I also think the older my circle gets, the harder it is to find a balance between word, to-do lists, and personal happiness. We always have so much that we should do that we forget about the things we want to do. I decided I needed some relaxed time in the kitchen making something fun and colorful for Valentine’s Day and these Chocolate Dipped Sugar Wafers were the result. Sugar Wafers are a light cookie that my mom always loved. They’re sweet and crisp, and I thought they would make a perfect little Valentine’s Day treat. Even more importantly, they would make a quick and easy Valentine’s Day treat that kids would love to decorate and love to eat. 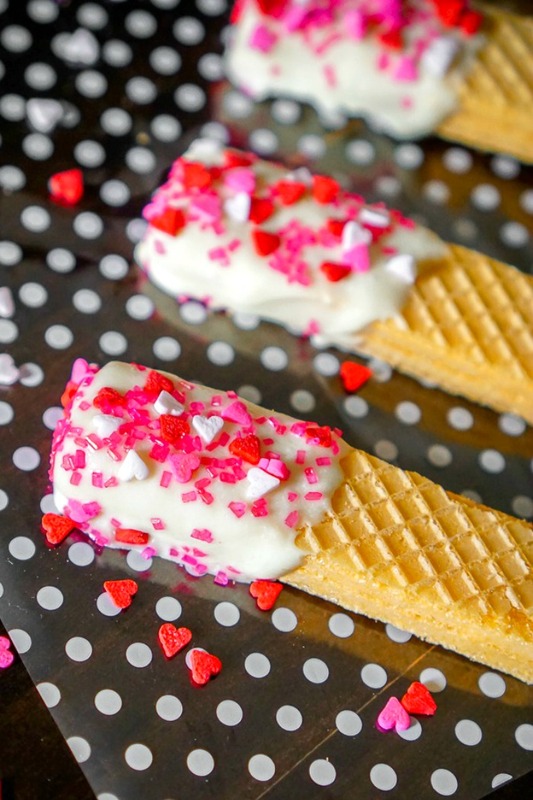 I dipped my wafer cookies in white chocolate and then decorated with Valentine’s Day sprinkles! If you are letting kids decorate, I recommend letting them pick out a few different sprinkles and a few Candy Melt colors: white, pink, red, purple or turquoise. They can even pick if they cant to use vanilla sugar wafers or strawberry sugar wafers. So many choices! 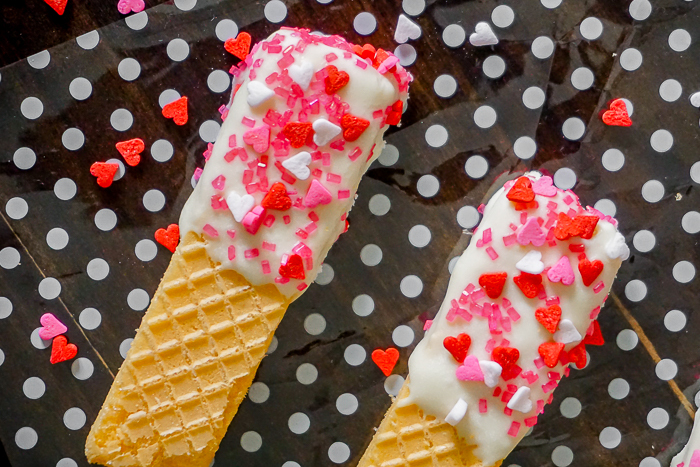 Time to Have Fun with the Kids Making These Chocolate Dipped Wafers Valentine’s Day Treat! Easy Valentine's Day treat for kids!! Chocolate Dipped Sugar Wafer Cookies are ready in no time, and kids will have a blast decorating them with chocolate, candy melts, and sprinkles! Melt your white chocolate or candy melts in a microwave safe bowl. Start with one minute, stir, and then in 30 second intervals after until all melted and smooth. Dip Sugar Wafers half way into melted chocolate and place on parchment paper. Then add sprinkles. I recommend dipping no more than 3 before adding sprinkles so the chocolate doesn't cool and dry before adding the sprinkles. I also recommend adding the smallest sprinkles first and then larger ones for best sticking. Continue until done and let chocolate and sprinkles cool and set before enjoying. I always like to give my kids a special little treat on Valentine’s Day. These would be just perfect. I hope I can still find heart sprinkles in the store.